Tall sorghum is grown in Africa, and the stalks are put to a variety of uses. 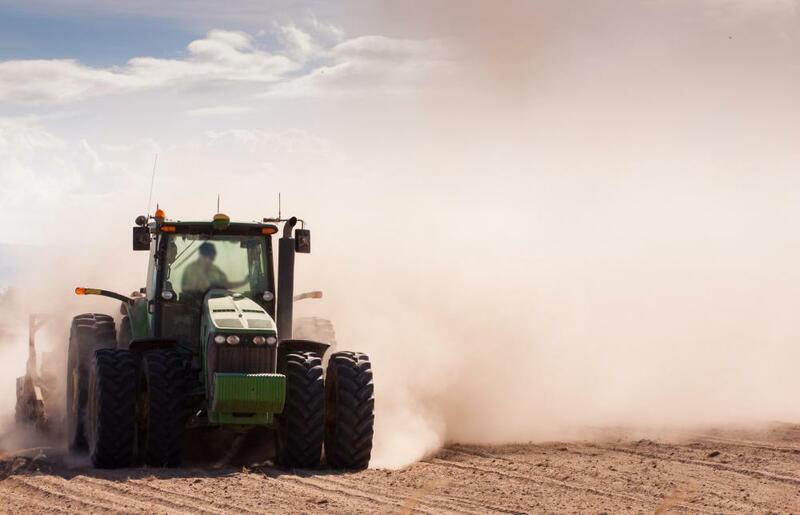 Sorghum is extremely drought tolerant, making it deal to plant in dry areas. Sorghum is one of the top cereal crops in the world, along with wheat, oats, corn, rice, and barley. 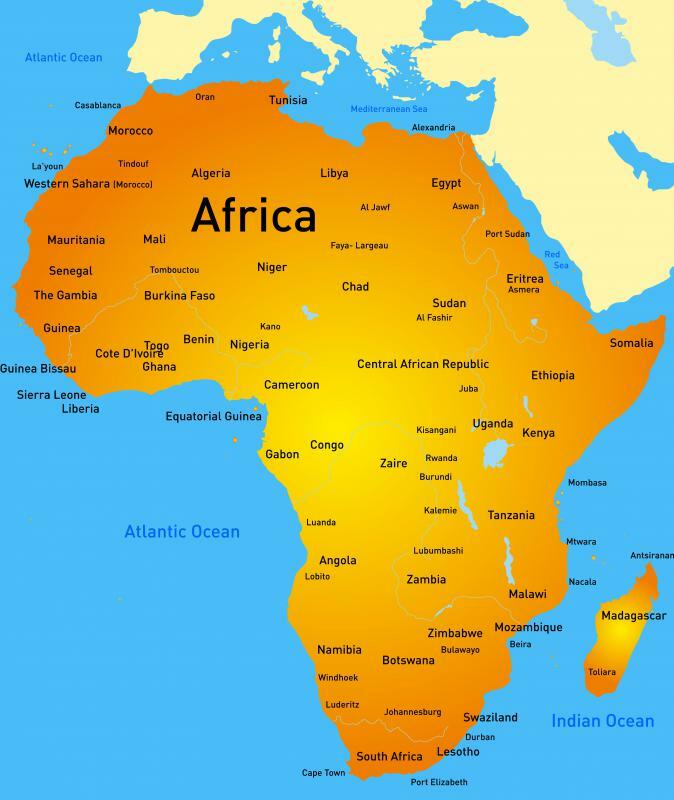 It was originally cultivated in Egypt in antiquity; the largest producers of sorghum in the modern era are still in Africa, although the crop has spread to southern Asia and the Americas as well. In traditional form, it is a towering plant over 6 feet (2 meters) tall, although many varieties designed for cultivation are dwarf breeds, specially designed for easy harvest. In Africa, however, traditional tall sorghum is still grown, and the stalks are put to a variety of uses. 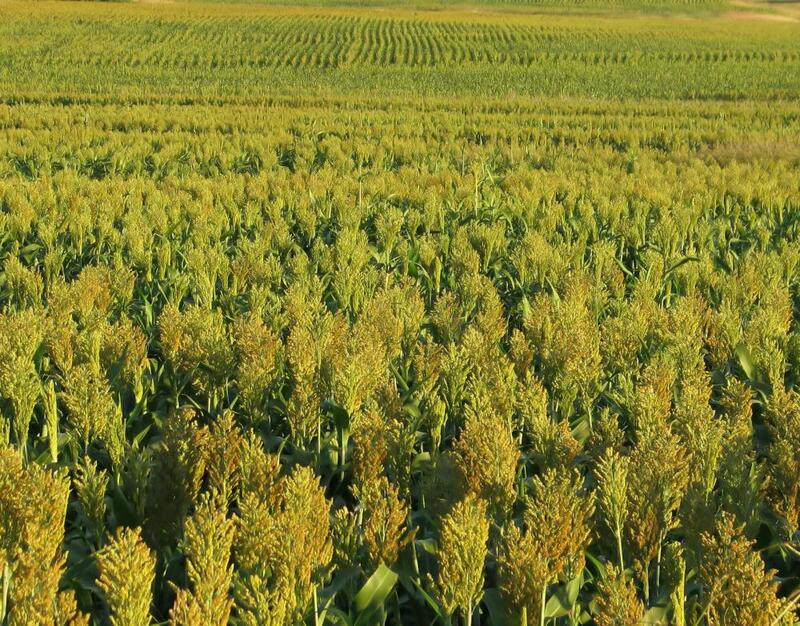 An annual grass that is extremely drought tolerant, sorghum is an excellent choice for arid and dry areas. This grass has special adaptations to weather extremes and is a very stable source of nutrition as a result. It is most commonly red and hard when ripe and is usually dried after harvesting for longevity, as the grains are stored whole. It can be harvested mechanically, although higher crop losses will result if the crop is too moist. Sweet sorghum is grown for the manufacture of syrup. In this case, the stalks of the plant are harvested, rather than the seeds, and crushed like sugar cane or beets to produce a syrup. After crushing, the syrup is cooked down to concentrate the natural sugars and packaged for sale. Like other slightly exotic grain crops, this plant is used primarily for animal feed in the United States, although cultivation of this grain is on the rise. The seeds, stalks, and leaves can all be fed to livestock or left in the field and used as a forage crop. In the United States, a wet milling method is used to make sorghum starch, used in a variety of industrial applications such as adhesives and paper making. In much of the rest of the world, however, it is consumed by humans as well as animals. Sorghum is favored by the gluten intolerant and is often cooked as a porridge to be eaten alongside other foods. The grain is fairly neutral in flavor, and sometimes slightly sweet. This makes it well adapted to a variety of dishes, because, like tofu, it also absorbs flavors well. It can also be eaten plain. This grain is commonly eaten with the hull, which retains the majority of the nutrients. The plant is very high in fiber and iron, with a fairly high protein level as well. This makes it well suited to its use as a staple starch in much of the developing world. Sorghum was probably brought to the United States by African slaves, who cultivated it in the Southern states. Some classic Southern recipes include it, suggesting that it was integrated into American cuisine by the 19th century, when additional strains were brought over from China. The grain is also used around the world to brew beers, with its close relative, broom corn, cultivated for the manufacture of traditional straw brooms. What Are the Best Tips for Planting Sorghum Seeds? @nice lady 888: So glad you've found something that works for your little boy; that's a lot of "staple" allergies (eliminates all staple foods). I have found coconut milk (the thick one, not the runny watery type) is very nice for a variety of things. , add my vegetables and meat. If I want stew, I whisk in a bit of brown rice flour and then let it sit a little on the stove (after heating) and it thickens. Very tasty. Another thing I've done is made brown rice flour, blueberry pancakes. I'm going to try using the br flour to make banana blueberry bread next. You could try that for both your children. I use my regular recipe I have from my cookbook that calls for wheat flour and just "sub" the rice flour. @anon 3739: As with most commercially packaged products, cross contamination of the sorghum flour with wheat depends where you buy it from. Some companies assure a "wheat free" facility (therefore nothing else has gone down that production line) and some don't. Hope this helps. @anon 830: I have a wheat intolerance -- a trace allergy, specifically. I would warn you stay away from Rye, Triticale and barley as they're all spliced with wheat genes. I have tested trace positives to these grains as well because of the close relationship with wheat. I didn't used to get sick until I got older. Within the last five years at least I can't consume wheat at all or I have flushing, itchy scalp, ears, red stinging face, etc. I have had skin sores. I get boils. I eliminated wheat and wheat type grains from my diet and it's all cleared up. @anon302452: I've never used sorghum as a marinade, but I've used it in gingerbread and baked beans, and it works well. I've heard of using honey as a marinade, so I assume it's along the same lines. I have a recipe for barbeque ribs with sorghum that calls for sorghum. Has anyone ever used it to marinate ribs? To everyone that has an allergy to anything it can be cured (except intolerance to wheat and Celiac Disease) by ridding your bodies of candida and repairing the leaky gut! Feed the body good salt like Premier Research Lab Pink Salt and other healthy sea salts - nothing from Morton's. Take a good iron source. There is one for Celiacs - EzFe- no prescription required, however, you must purchase it over the counter at a pharmacy. Use l-glutamine and probiotics to strengthen the body. And, of course use the antibacterial, antifungal Barlean's Olive Leaf Extract. Healing can be yours. It just takes time and patience. Cut all sugars and go as grain free as you can. No GMO, only organic foods and grass fed meats. Try buffalo as it is a great source of omega 3s which we need plenty of. Happy healing! My sorghum porridge was so lumpy so I poured it in a blender for a few seconds and then resumed cooking it. Would this have prevented me from getting the benefits from the sorghum porridge? Thanks for all or any information about this wonderful flour. I welcome all answers and comments. thanks for this information. i saw this product in the supermarkets in khartoum and was wondering what it was. now i know what it is. Thanks for the information. We get to Santa Barbara often. I asked about using it raw because we like to eat as much home grown raw foods as possible. We have a few chickens and have found that the milo (sorgum) germinates and grows here in the desert very well, with little effort and water. We will be growing a test plot this spring and can use all the info we can get. For one, does the plant favor a particular photo perion to flower, etc. Thanks. Rudis of Colorado makes the best gluten, dairy, soy, and tapioca free bread ever! Sorghum flour is the magic bullet! It freezes and separates into slices perfectly and when toasted does not fall apart in sandwich form. Did I mention it is also the best tasting bread choice ever for the celiac/allergy individuals choice. Susan, Lompoc Ca. we buy it at "Lassen's" in Santa Barbara Ca and in Santa Maria Ca. Is it advisable to eat the grain raw? Does any one know a source for recipes,and dietary information. i'd like to know how many species of sorghum there are in the world. We do not need to create new words, vocabularies or expressions to advocate africans and condemn the white man's deeds in Africa. Keep the words "slavery" and "slaves" as they are. Are they ugly? Yes. The uglier they look, the stronger they pierce human conscience. for those using the word "slave": that word should never be used. the word that should be used is "enslaved," because africans (or any race of people) had an identity (i.e. Africans) before they where so called "slaves," hence enslaved Africans. the word enslave puts the blame on the correct person which is the slave owners, not the enslaved. Slaves were not given time to pack their suitcases, but once they settled in the new land and became involved in field and kitchen work, they asked their masters to bring them many ingredients they were familiar with. Slavery continued and ships continued going back and forth through the ocean. so sorghum was brought over originally by african slaves? LOL. interesting historical fact: they were given time to pack their suitcases and bring things they might need. I did not know that. I am a graduate student working on my PhD in Cereal Quality Lab. Texas A&M University, College Station. We did a lot of work to develop different types of product by using sorghum for people who can't consume gluten at all. please someone tell me about breeding methods of sorghum and also about hybrid sorghum. -bettani. I too am interested in sorghum/corn. I have an allergy to corn and understand sorghum is related to maize which is related to corn. Anyone know if they are similar enough to cause a reaction if you are allergic to corn? Can anyone provide me with information on where to find some perennial forage lines? Can any one tell me what is the difference between sorghum and corn in use? Can you tell me what irrigation methods if any are most suitable for sorghum production please? my son is allergic to wheat, milk, soy and eggs. sorghum flour is safe and he can take rice milk instead of cows milk. is any wheat free is available? if it is, pls tell the location and for rice milk. Can anyone please give me the nutrition analysis of white sweet sorghum grain or flour? What are its advantages other than being gluten-free? 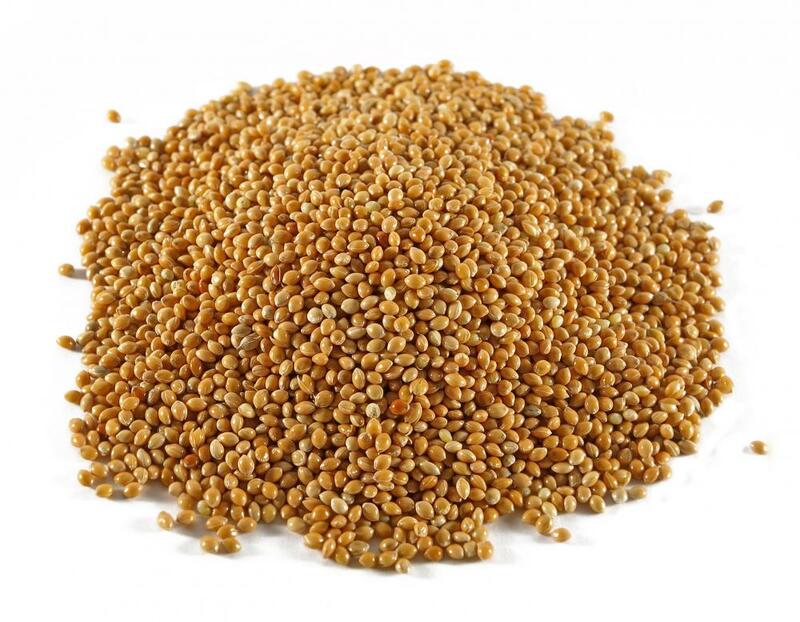 My 4 year old daughter is allergic to grass pollen, wheat, oats, barley, Rye - not celiac - Is now allergic to Sorghum - I think because its in the grass family, the allergy developed about a year after she was introduced to Sorghum. my son is severely allergic to eggs, wheat, milk, soy, peanuts/nuts, oat and some other things. i tried so much ingredients to bake cakes, cookies. i have tried the ready mixs from whole foods.. which turned out very awful. till i found sorghum flour in the asian grocery store and tried it out. i was so happy coz it tasted wonderful, even my daughter who has no food allergy loves it. i baked blueberry muffins last week. they enjoyed it a lot. this afternoon i tried banana bread, and i myself love it. i am so happy.. happy.. happy, that i could make something safe and tasty for my son. i am planning to try making some bread with sorghum flour and even... birthday cake for his 3rd b'day!!! My daughter is severely allergic to wheat as well as all dairy, eggs, peanuts/nuts, among other things. Is there a risk of allergic reaction with sorghum flour? Is there ever cross-contamination with wheat? I would love to know before I try and am sorry. This was so helpful, as I am allergic to wheat and barley. I just found a commercial cereal that is primarily made of sorghum flour (Nutty Flax by Pesky's). I did not want to start eating a different grain that is closely related to wheat, such as is rye or triticale, that I have not been tested for.